I am proud to share that summer 2019 will be my 24th summer working at Running Brook Day Camp, my twentieth summer as the Program Director and my ninth as the Director of Summer Programs for Chapel Hill - Chauncy Hall School. I am very excited about the continued growth of our camp programs. As a licensed Mental Health Counselor, I have spent the majority of my post-grad school work in various elementary and middle schools, both public as well as private therapeutic settings. I also spent fifteen years as a part-time clinician at The Academy of Physical and Social Development in Newton, where kids play actively in small groups as they work to build their social and physical skills, as well as their self-esteem. Throughout that time, I have spent my summers working at Running Brook, where I was continuously reminded of the incredible importance of a structured, fun, nurturing environment for kids of all ages during the summer months. There is so much growth that can happen for kids in a relatively short time at camp in the summer; taking on new physical challenges and trying new activities, enhancing social skills and making new friends, growing in self-confidence and feeling a part of a larger, close-knit community. It is no coincidence that nearly all of my professional time is now spent with Running Brook Camps - a place where every member of our community spends the summer laughing, playing, learning and growing together. I am very fortunate to have found a career working in such a great place. Outside of camp, I spend as much time as possible outdoors with my wife, young daughter and our dog. Much of that time is spent on a snowboard, in a pair of snowshoes, camping, in a kayak or on a hiking trail in Vermont, our “home away from home.” I’m looking forward to another great summer at camp. 2019 will mark my 11th Summer here at Running Brook and honestly I still feel the same level of excitement each year as I did my first! I am absolutely fortunate to be a part of a work environment that at the core, values community, compassion, challenge, creativity, cooperation and celebration above all else. Before RBDC, my professional road started when I received my Master’s degree in Mental Health Counseling from Lesley University. From there I worked in various settings providing home-based, school and crisis intervention counseling for children and their families. I continue to love coming to work every day where the goal is to create a nurturing environment where staff and kids alike can learn, be silly, make friends, step out of their comfort zone, unplug and most importantly - play! The fun doesn’t stop for me when I leave camp. I go home to a goofy and inquisitive toddler, two playful pups, a cunning kitty, and 16 peaceful, giant goldfish. I can’t wait to see you at camp! I am excited to be a part of the Running Brook community for my fifth summer! Camp is the time of year I get to enjoy the outdoors, engage in group activities and help campers create their own success! My passion is working with campers to feel comfortable and excited to be at camp despite any social or emotional challenges they endure, along with mentoring counselors to feel confident and prepared to assist with such challenges as well. Prior to this fabulous job of dressing up like Cool Runnings or getting pied in the face, I received my Bachelor's of Science in Human Development and Family Studies, and then received my Master's and License in Marriage and Family Therapy. During the school year, I work in private practice as a life coach for children, adolescents, and adults at LexCommunicate and the FUSE program. My favorite part of the year is the summer time due to the warm sun, refreshing swimming pools, popsicle Tuesdays and dance party Fridays! ﻿I am thrilled to be returning to Running Brook for my fourth summer and consider myself one lucky guy! As an Assistant Director, I get to spend my time in the company of our awesome campers and staff, on our beautiful campus, enjoying the outdoors, while helping ensure that we all have a fun, safe, and memorable summer together. Although I grew up in California, I’ve also lived in Mississippi, Massachusetts, New Zealand, Italy, and Malaysia. I have many hobbies but some of my favorites are running, traveling, playing golf, and scuba diving. While I love those hobbies, my true passion and calling in life is to support and foster the emotional and social well-being of children and adolescents. After getting my Bachelor’s degree at Boston College in 2012, I joined Teach For America and became a high school math teacher in Jackson, Mississippi. After two years of teaching, I recognized that I needed to pursue a career in counseling and graduated from BC in 2016 with my Masters in Mental Health Counseling. In addition to my summer position at RBDC, I am a full-time Upper School Counselor at Beaver Country Day School, I carry a small group practice caseload, and I am a Practicum Supervisor for graduate students earning their M.A. in Mental Health Counseling from Boston College. These various roles all allow me to use my clinical skills and passion to help children and adolescents live happy, healthy lives. I’m excited to do the same this summer at camp! I am so excited to be returning for my ninth year at Running Brook Day Camp. Camp has always held a special place for me. I truly enjoy being able to watch kids learn and grow over the years, developing lasting meaningful friendships and creating a strong bond with amazing counselors. When I am not at camp I work as a school adjustment counselor in Medford and I also have a small private therapy practice. I have always had a strong love for music and play drums, guitar, and piano. I love spending time with my family be it going to the beach, skiing, hiking, playing outside or just relaxing around the house. I feel so fortunate to have the opportunity to get to know and work with the campers and staff at Running Brook and I look forward to meeting you soon! "They make the camp feel very personal and welcoming despite the scale. Couldn't be more impressed with camp administration." I am so looking forward to my third year at Running Brook Camps - it really is the highlight of my year! I love spending the summer playing games, meeting new friends, being silly, and - most importantly - making connections with the kids at camp. My very first job was at a performing arts summer camp, and I have fostered my passion for working with children in various capacities since then. I received my Bachelor's degree in psychology from UMass Dartmouth. While I was there, I spent time as a mentor in the Big Brothers Big Sisters program. This program sparked my desire to learn about development and gain the skills necessary for building strong relationships with children. I went on to receive my Master's degree in Child Study & Human Development with a concentration in Clinical Psychology from Tufts University. I am now a kindergarten teacher at the FUSE program during the school year, where I work with students to develop their social skills. It is so wonderful to have the opportunity to work with children in two different settings, and to help them have fun, learn, and grow in a group! One of my favorite things to do is learn everything I can about a child - from their favorite color to their biggest worry - and use that knowledge to support them in challenging situations. Outside of work, I love reading, swimming, going on outdoor adventures, and spending quality time with friends and family. I can't wait to dress up, wear wacky socks, play mat ball, eat tacos, (maybe) try some high ropes, and enjoy all the other things that camp has in store for this summer! I’ve always said my dream job is to be a professional camp counselor and though I've yet to find a way to work at camp year round, I've been pretty successful at coming "home" to camp in the summer. In 2007 (after 10 years of attending/working at overnight camp), I found Running Brook and a new adventure began! 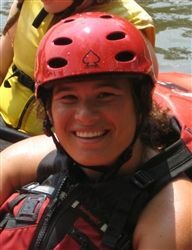 This is my 11th summer with Running Brook Adventures and my 4th Summer as Director! I love supporting kids in stepping outside of their comfort zones, recognizing their own strengths and building connections with others. Through hiking, biking, kayaking, rock climbing and camping, Running Brook Adventures provides the perfect opportunity for this growth and I am beyond excited to be part of it. During the school year, I am an in-home therapist at Wayside Youth & Family Support Network where I provide support and counseling to youth and their families. I have many years of experience working with youth in schools, after-school programs, and camp settings, and I am passionate about empowering youth to make a change in their community. In my free time, I love to travel, take pictures, play softball and spend time with friends and family. I love being outdoors, and am excited for this summer and all the new adventures to come! ﻿I am excited to share that this is my 2﻿4﻿th year with Running Brook! When I started out, I was doing the accounting work for camp behind the scenes. A few years into it, I began managing the camp office year-round. For the past eight years, I have been both the camp Office Manager as well as the Accounts Receivable Manager for Chapel Hill-Chauncy Hall School. I have very much enjoyed being directly involved with the campers, parents, and staff each summer and throughout the year. It is great seeing the kids summer after summer, watching them grow-up and getting to know so many of their families. Some of the things I enjoy doing outside of camp are cooking (either for my family at home or in East Hall for my family at work), volunteering, traveling and in the summer hanging out by the pool and entertaining. "I have had very positive interactions with all of the camp administration - they do a wonderful job."